My daughter chose the colors and then wanted to add extra features with a marker. She also poked it on the top of its head, but it still works! Photo by Grey Catsidhe, 2016. When Samhain / Halloween decorations and materials started showing up at the craft stores, I snatched up one of those small, papier mâché skulls. At the time, I didn’t have a project in mind, but I knew something would come to me. It wasn’t until my daughter was playing with it that we stumbled upon its purpose, which makes sense given the (very informal) research I’ve been doing on rattles. She put some toys inside the skull and shook it. She said she wanted to make a rattle like her egg shaker. I thought that was a brilliant idea. Gathering materials. Photo by Grey Catsidhe, 2016. Pour some glue or modge podge into your old plate or tray. Using the paintbrush, work a layer of adhesive onto the skull. Bee wanted a paintbrush too, so we worked together. As you paint, smooth pieces of tissue paper over the glue. Make sure you put your dry beans (or other filling) into the skull. Gradually cover the openings in the skull with several layers, taking care not to puncture the wet tissue paper. You may want to do the top first, let that dry, and then do the bottom for easier handling. Once the whole piece is dry, you may want to decorate the skull to bring out its features. We did not add a final layer of gloss, but I think it would be a good idea to preserve your piece. I enjoyed making this instrument for a variety of reasons. It was a fun, easy project to complete with my daughter. At three, she’s learning to cut, so she had fun practicing with scissors and tearing tissue paper of her choosing. It’s a great use for wrinkled, torn tissue paper if you’re like me and try to reuse everything until it’s falling apart. 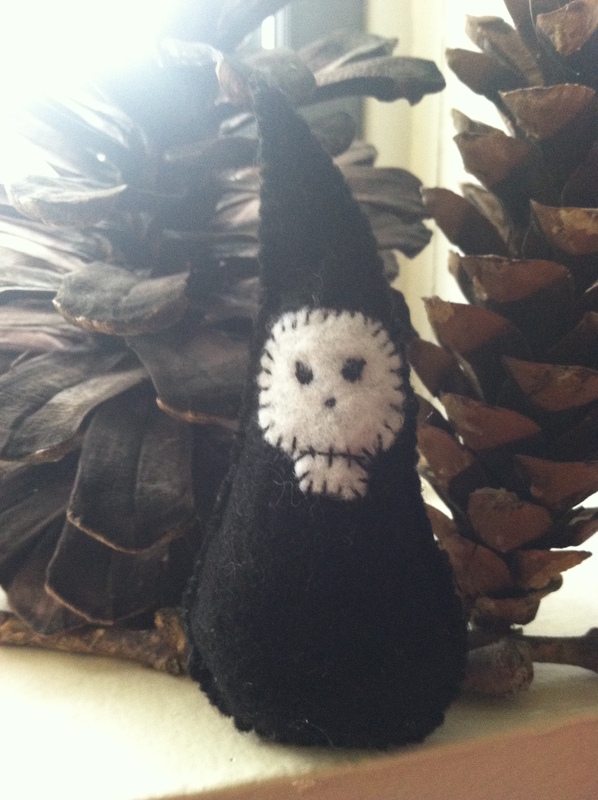 I would like to make more rattles year in different colors – white and black, perhaps. It could be a fun grove craft project. 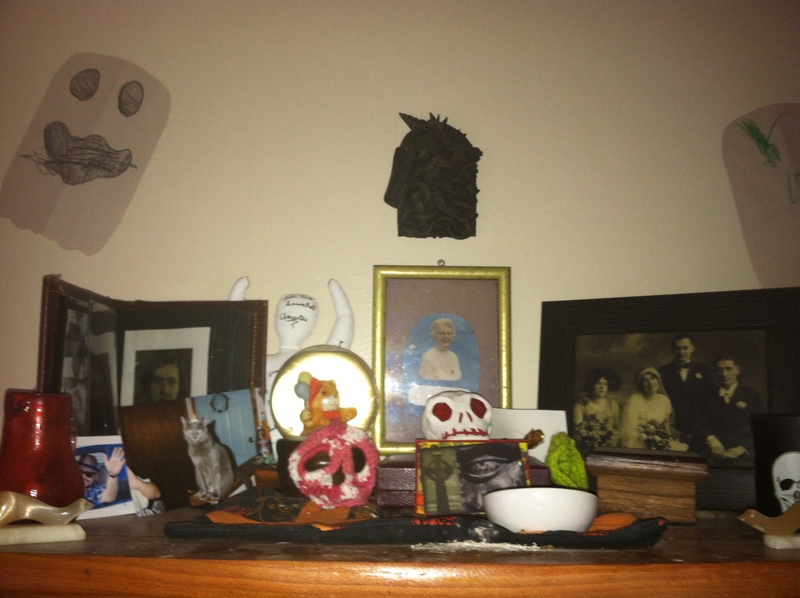 The skull rattle joined us at my grove’s Samhain celebration. Bee and I played it while we chanted. It doubles as a seasonal decoration. We’ll have to keep our eyes open for more papier mâché shapes appropriate for other celebrations. Another Samhain has come and gone in my household and protogrove. Some, like myself, observed it from October 31st-November 1st (sundown to sundown). Many celebrated this weekend, for reasons of convenience or celestial precision. 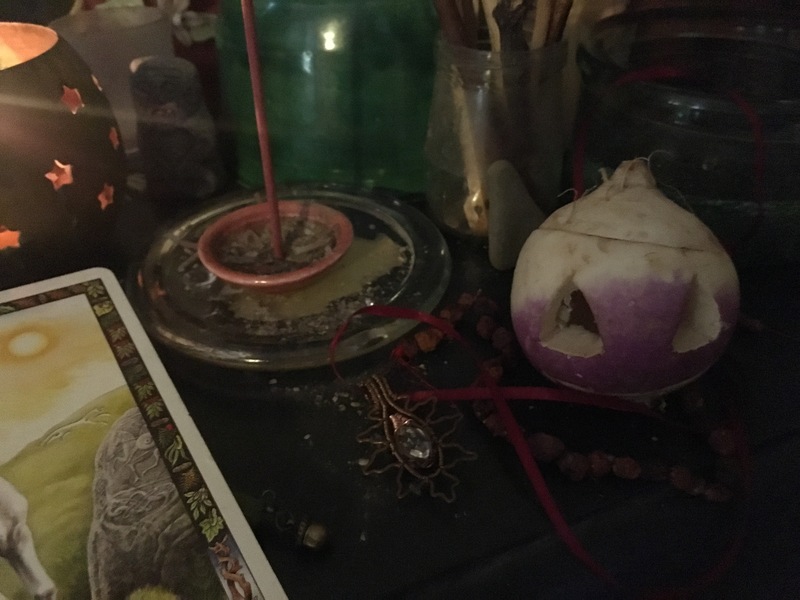 I know of some people who honor it all month long, which is totally fine, as the veil between this world and the other seems to gradually “thicken” and “thin.” As for myself and my tribe, 2015 Samhain has ended (though we may sense our ancestors from time to time). I’m always a little sad when Samhain ends, being an adult who has regular conversations with her inner child. I love the magic, the mystery, and the socially acceptable guising. I also need, as most do, the emotional release that comes with meditating on and facing mortality. I had a bit of a health scare at the beginning of October. Everything turned out well, but it was enough to make me pause and prioritize! The fact that a high school acquaintance died in his battle with cancer a few months before really added to my sense of how delicate and precious our time is. Regardless of what we may or may not believe about an afterlife, the truth remains a mystery to the living. The here and now, and our time in these particular bodies, is such a gift that should not be taken for granted. Even when so many of us in the polytheist and Pagan communities believe in some sort of continuation after life, we miss our beloved dead. Personally, I accept the ambiguity of what happens to our energy. The fact that our physical remains will go back into the cycle of creation and destruction, and that our bodies will mingle and always be together in some way, is profoundly beautiful to me. I take comfort in that, and I’m sure many in my protogrove do as well, yet we still mourn our dead. Northern Rivers’ Samhain Bonfire – photo by Annette P.
Northern Rivers Protogrove, ADF, gathered on October 31st at the Kripalu Yoga and Wellness Center to celebrate Samhain. Despite the biting cold, we had our ritual at their stone circle. That in itself was an exciting homecoming, and with the added psychic and emotional intensity of Samhain, it meant for a moving ritual. Many of us were already tearing up as we gave praise offerings to the Ancestors. When we got to our traditional apple rite, something passed on to us from Muin Mound Grove, some of us actually had to leave the circle for a bit to calm our nerves. As we passed the apple, a potent symbol for the Otherworld, we named those who had passed since last Samhain. As we named them, we pushed a clove into the apple. The group then intoned, “come to the light” to the accompaniment of a chime. We called the “Young Ancestors” to our firelight to gather with the “Elder Ancestors” who know the ways back to the Otherworld. Samhain always makes for a long yet intense ritual. Today I decided to take my household Samhain decorations down. As you can imagine, there’s always a little sadness as you remove the relics of festivity. As I packed the skeletons and ghosts away, it felt like the veil closing on the dead. Yet, I reflected, the Ancestors are always there. I can always call to them beyond the veil, and there’s a chance that they may hear me with the assistance of messenger spirits, strong bonds, or intense emotions. The spirit world can be a strange thing in that way. And just as the paper, metal, and wooden skeletons will reappear in my home again, Samhain will also be reborn next year. In previous years, I’ve posted photos, tutorials, and even lore-based reasons for carving turnips. 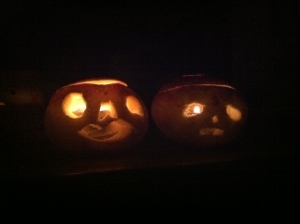 It’s become a part of my family Samhain celebration. They are tough veggies to carve, even with strong, well-made spoons as I’ve suggested. I’m proud to have resurrected the tradition in my own family. I excitedly turn them into protective talismans, warding the home against nasty spirits who may be out and about while the veil is thin. As I exercised my muscles gouging turnip flesh out, I reflected on how tough the job is. The difficulty is not so great that it discourages me from keeping it. While thinking this, I meditated on the challenges my Irish ancestors faced: poverty, famine, immigrating across the Atlantic, leaving loved ones, and starting over in America. Carving the turnip can be a devotional act, reminding us of the difficulties our Irish ancestors faced.